Serving at God's Altar: Why not you? 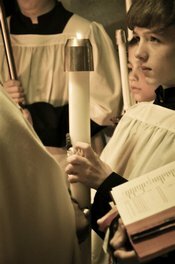 If you have a deep love for Jesus Christ and want to add a new dimension to your relationship with Him, why not consider becoming an altar server? As a server you will join, in a unique way, in the worship of the Church throughout the world. As a server you will help Father Vernon Huguley as he offers the one, eternal sacrifice of Jesus, our great High Priest. If you are in the 3rd grade (and up) please contact Father about becoming an altar server. The Church needs you.